Landscape. Silkeborg is on the face of it a naturalistic registration of a random section of the landscape. But its powerful exploitation of the standard props of landscape art makes it difficult to regard the landscape as naturalism pure and simple. It is more dramatically treated here. The trees in the foreground have been given an important role in the picture: they tower tall above the horizon and produce a striking silhouette effect. The tendency to use isolated, vertical figures such as trees, rocks or buildings to create drama is typical of Kyhn and on the whole of Romantic landscape art. The foreground and background of the picture are separated by a lake. The observer cannot take an imaginary walk through the picture, but must be content to view the background from the lake shore in the foreground. The picture forms a “here” and a “there” with clear metaphysical overtones. The distance between foreground and background is underscored by the use of colour. The heather-clad hills of the background attract the eye with their beautiful violet glory of colour, and the trees seem, with their inclination, to reach out for the hills, as if they were a promised land on the Other Side. With these devices Kyhn approaches an almost kitschily romantic view of landscape, which he was one of the few to border on in the otherwise naturalistic Danish Golden Age painting. 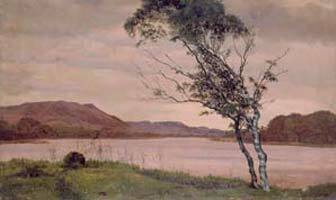 Vilhelm Kyhn was a landscape painter, and in particular painted many motifs from Central Jutland. He kept within the bounds of the Danish National Romantic landscape tradition and preferred to show atmospheric scenery with fjords and hills.